From PolicyD website : Policyd v2 (codenamed “cluebringer”) is a multi-platform policy server for popular MTAs. 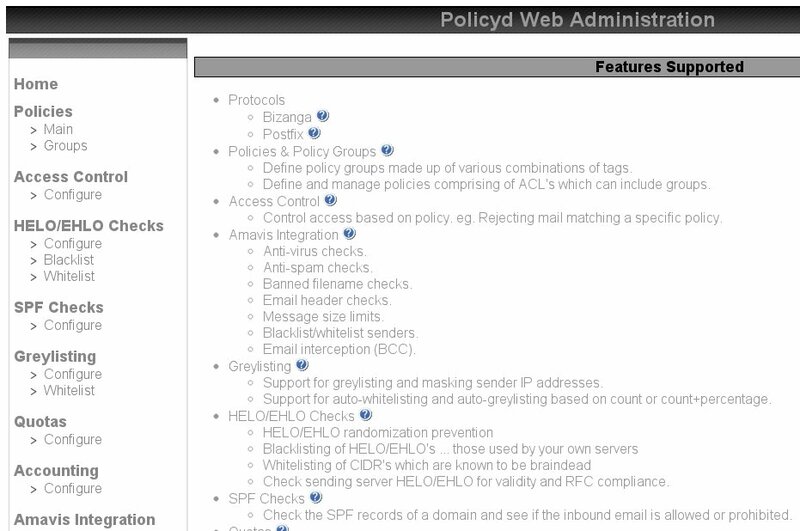 This policy daemon is designed mostly for large scale mail hosting environments. The main goal is to implement as many spam combating and email compliance features as possible while at the same time maintaining the portability, stability and performance required for mission critical email hosting of today. Most of the ideas and methods implemented in Policyd v2 stem from Policyd v1 as well as the authors’ long time involvement in large scale mail hosting industry. PolicyD can be integrated into Zimbra to add an anti spam layer, especially for rate-limit sending message. We can set maximum messages both for receiving and sending policy and prevent mail server IP address to be blacklisted due to spam message to outside network. PolicyD activation procedure on Zimbra 8 is slightly different from the procedures on previous version. Some of features on PolicyD include Access Control, amavis, CheckHelo, CheckSPF, Greylisting, Quotas and Accounting. The new features can be configured through the Web Administration Policyd as well as standard feature. Below are PolicyD activation procedure on Zimbra 8, fully tested on Zimbra 8.0.6, the latest version of the time this article was written. i try to install on ubuntu server. but cant access webui. can u guide me? ?